How cold are your toes? If you're currently in Ontario, my guess is pretty darn cold. The old mercury dipped down to -34'C last night - Brrrr! 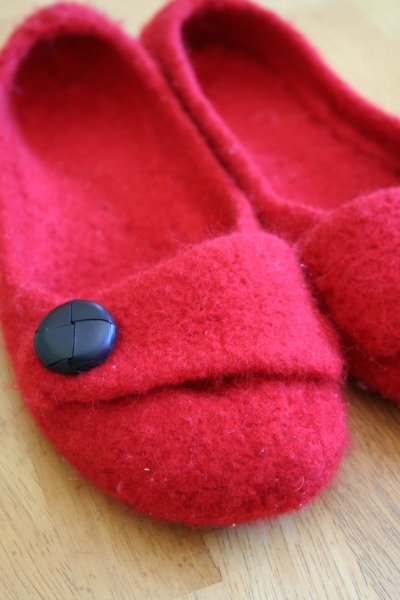 I am so, SO very thankful I completed my slippers a few days ago. It's been heaven. On my feet. 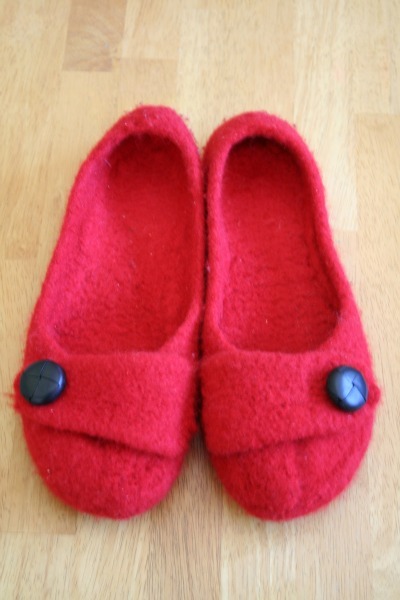 Above is what the slippers look like pre-felting. 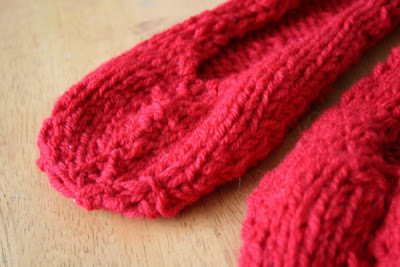 I liked knitting them because I didn't have to worry about 'perfect' stitches...all is forgiven during the felting process. ...they were popped into a pillow case and tied shut. 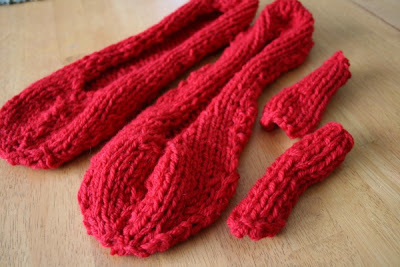 Then, the little tootsie warmers were tossed into the washing machine on the hottest setting. It took about 35 mins to felt the slippers and 20 mins for the straps. 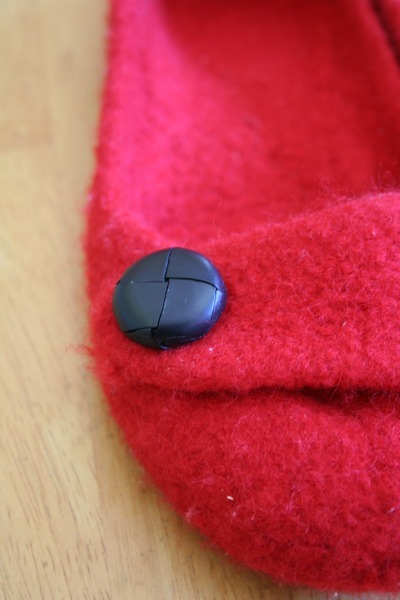 I have a top loading machine, which works best for felting. The pattern suggested adding tennis balls or old shoes to increase the amount of agitation. I had neither....but I did have rubber dog toys :) Front loading machines will work, but I am told it takes longer. Here they are drying! 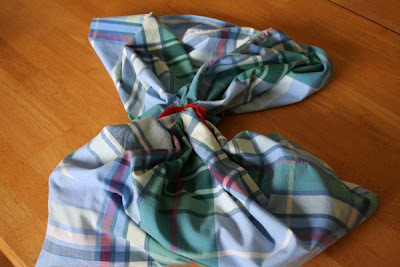 I stuffed some rags in them at first to hold their shape for a few hours. Then I decided that I wanted my slippers to be shaped like feet, not like mushed up rags...so every few hours I'd put them on my feet and walk around in them. It took 3 days for them to dry completely. Once they were completely dry, I sewed the straps and buttons on. 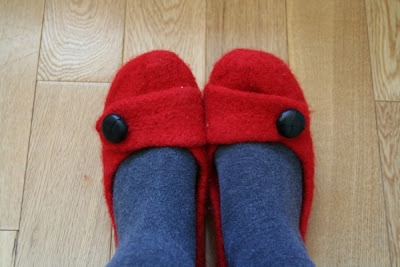 I heart slippers! You know what else helps to stay cozy? 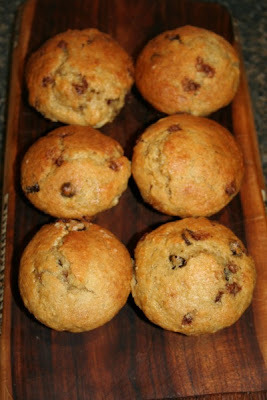 Baking some banana chocolate chip muffins. *Insert Homer Simpson-esque Drool*. I'm in love with the recipe from Canadian Living. Actually, I'm in love with 99% of the recipes from Canadian Living. If I'm looking for a recipe, I search there first! Anne. I really like this blog entry. You have given us a wonderful photo essay of the felting process. 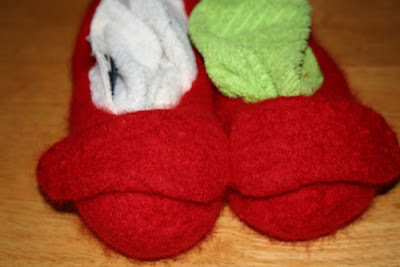 I will definitely do a pair like these perhaps this summer when I am home and you can supervise. And then the last photo of those delicious looking muffins!? the perfect ending. You are the best. As I said, I love your blog! Thanks so much for taking time to do it amidst all the baking and making.